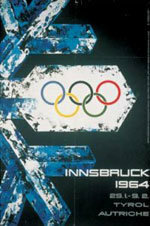 The popular winter sports town of Innsbruck had lost the battle for the Winter Games in 1960, but now Austria had its first Olympics. The Games continued to grow. Over 1000 competitors from 36 countries took part this time. The women’s 5 km Nordic and K120 ski jumping were new events. The Soviet Union was best yet again, while Norway with its 15 medals did better than for many years.